A word of note: People often misunderstand that if they earn let’s say Rs.12 lakhs, they will be paying a 30% tax on Rs.12 lakhs i.e Rs.3,60,000. That’s incorrect. A person earning 12 lakhs in the progressive tax system, will pay Rs.1,12,500+ Rs.60,000 = Rs. 1,72,500. Income has been very widely defined in the Income-tax Act. In simple words, income includes salary, pension, rental income, profits out of any business or profession, any profit made out of the sale of any specified asset, interest income, dividends, royalty income etc. The law classifies income under 5 major heads as already mentioned above. Elections are a mammoth event in our country. India being the biggest democracy in the world draws a massive number of voters to the voting booths every year. With 900 million eligible voters, India is definitely the largest democracy in the world. 2019, is a crucial year for our democratic nation given that the most significant democratic election is going to be held soon. The Election Commission of India (ECI) is a self-governing constitutional body which oversees the election process in India as per the Constitution of India. Voter ID card is an important ID to vote in the election. Discover a step-by-step breakdown on Voter ID Download. Read more about voter id download. A surcharge is an extra income tax to be paid by the taxpayers earning a higher income. Read the provisions of Marginal relief on surcharge with examples. Aadhaar card status update, inquiry, and more processes have been made online by the government. Read on to know the stepwise process for Update etc. Know how to download e aadhaar card online. Check status and step by step procedure to download Aadhar card via self-service aadhaar portal & via enrolment centre. Know how to apply for Driving License Online by reading our step by step application process. Also, know the procedure to check the application status online. 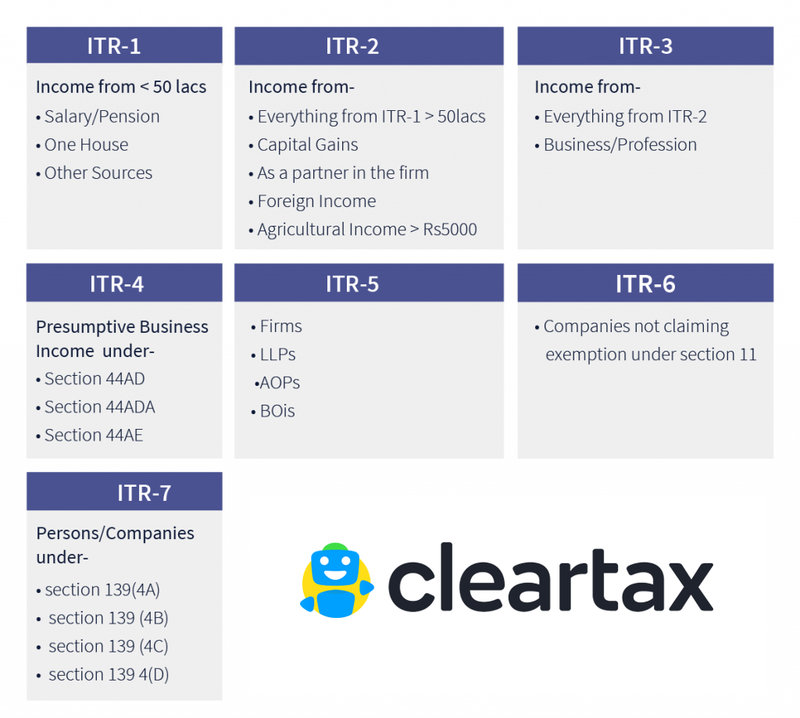 ClearTax has compiled a list of important budget-related terms with its definitions and understand the upcoming Budget 2019 with ease! Interim Budget 2019 - Get Live Updates by Piyush Goyal on Indian Budget 2019. Aadhar card serves as a proof of address and identity. Therefore all details in Aadhaar should be accurate. Read on to know how to update aadhaar online or through Enrolment center. Using Passport Seva Online Portal we can easily get a new passport or renew an existing one. Read on to know more about it & stepwise registration and login process. Passport is a very essential document & bringing it online has made it easier. Read on to know more about stepwise registration, online application login, renewal etc. URN – How can you check the URN status? URN or Update Request Number is a unique number allocated to you when you apply for correction in your Aadhar Data. Know more on how to check URN status online, Aadhar update etc. The Income Tax Department processes the income tax return only after they are filed and successfully verified by the taxpayer. Read on to know in more detail. Interim Budget – Meaning & How it’s different from Union Budget? Budget 2019 will be the most crucial budget as it is an interim budget. Read here to know the expectations from this upcoming budget 2019. ClearTax just raised $50 million dollars led by Composite Capital. We are India's first to be funded by Composite Capital. Income Tax Return Filing is beneficial even if you are under non-taxable income bracket. Learn more about the benefits of filing ITR. ITR Late Filing Penalty - Filing your tax returns after the due dates has more consequences than just penalty. It impacts the carry forward and set off of losses and time for receiving the refund. Section 80QQB : Deduction on royalty income earned by authors. Authors can claim section 80QQB deduction on royalty income. Let's see the procedure for claiming deduction under income tax along with Form 10CCD format. Know about the income tax on residential status & it's importance, determination for status of Resident, Non-Resident & Resident Not Ordinarily Resident & its taxability. A step wise guide for how to check your PAN application status online?. Read more about Tracking based on acknowledgement number and Name and Date of birth. A Voter ID Card is a photo identity card issued by the Election Commission of India to all Indian citizens eligible to vote. Voter ID card also know as EPIC or election card is an identity proof of the voters. Read more about voter id card. UIDAI - the article gives a detailed understanding of the role and functioning of the www.uidai.gov.in / Official Aadhaar Website. It explains how one can have information changes on the Aadhaar or link other accounts to Aadhaar. Pradhan Mantri Awas Yojana ( PMAY ) aims to provide housing at an affordable price to the weaker sections of the society. Read on to know more about Pradhan Mantri Awas Yojana . Plan your future wealth accumulated with ClearTax Savings Calculator. Know about benefits of calculating your savings &amp; get to know how much you should save for your/ family future. This article talks about the ways to link your Aadhaar with Mobile number. Read on for step by step process to link aadhaar to mobile number. EMI Calculator Online - Calculate your Equated Monthly Installments for any kind of loan with ClearTax EMI Calculator. Check your car, home, education and personal loan. Letter of Intimation u/s 143(1) & Responding to Notice u/s 143(1)(a) - A step-by-step guide on how to reply to a income tax notice on mismatch in return income with Form 16/16A. NSDL website &amp; UTIITSL website have been authorized by the govt.to carry out PAN transactions on behalf of the Income Tax Department. Read this article to know how to apply for PAN Card &amp; how to make changes or corrections in your Permanent Account Number. E-proceeding link has been added on the e-filing website to reduce human interface in the process. Find out the Income Tax slab tax rates in India for FY 2018-19 (AY 2019-2020) & FY 2017-18 (AY 2018-19) . Theses tax slab determines how much you will pay in taxes acc. to your salary bracket. A guide with screenshots on how to link aadhar to PAN Card/ Permanent Account Number. 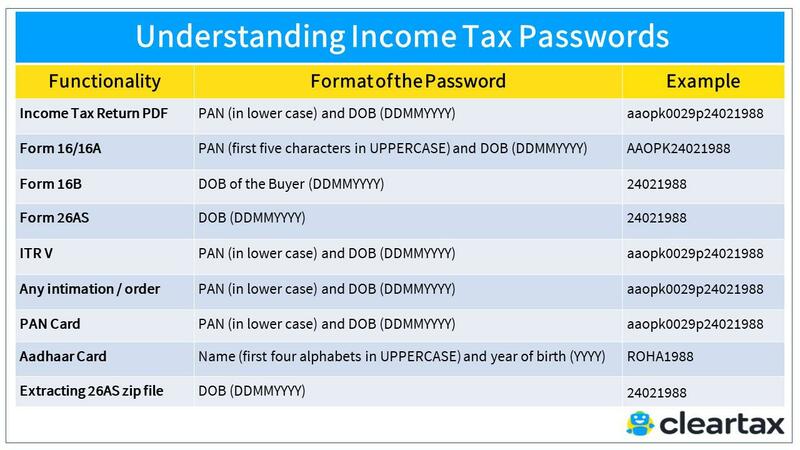 Compulsory to provide both Aadhaar & PAN Crad pannumber while filing Income Tax Return ( ITR ) . Income Tax Department has made PAN card mandatory for HRA Exemption. Find out what to do in case your landlord doesn't have PAN. Find out which taxes on Lottery, crosswords and game shows are applicable on the prize money received. Check for TDS applicability. Did you receive an Income Tax Notice to file returns? Here's the step by step guide to submit the compliance form online at Income tax department website. The government has introduced measures to stop circulation of black money. Here's what you need to know.